After a tough Race 1 yesterday, Pata Yamaha Official WorldSBK Team rider Michael van der Mark bounced back impressively today, with a superb ride to third place in a thrilling Race 2 encounter at Magny-Cours. Alex Lowes also staged a comeback with a solid ride to seventh place today, after a crash in the early stages of Race 1 dashed his hopes of a points scoring finish yesterday. Van der Mark’s crew made significant changes to the set up of his Yamaha YZF-R1 ahead of Race 2, in a bid to solve some of the issues he experienced in the race yesterday. It was a carefully calculated gamble, but one that paid dividends for the 25-year-old this afternoon. Starting from the head of the second row of the grid van der Mark made a fast and aggressive start that saw him slot into second place behind early race leader Chaz Davies. The Pata Yamaha rider then managed to fend off a concerted attack from Jonathan Rea, but the newly crowned World Champion eventually forced his way through and set off in pursuit of Davies, with van der Mark in his slipstream. Van der Mark kept Rea and Davies in his sights until the closing stages of the race when the two leaders managed to pull a small gap on the Pata Yamaha rider, leaving him to cross the line in third for his tenth podium finish of the season. Van der Mark remains third in the championship standings, but now trails second-placed Davies by 26 points with four races remaining. Having crashed and remounted to finish outside the points yesterday, Lowes went into Race 2 today determined to salvage his Magny-Cours weekend with a solid result. Starting from 10th on the grid the 28-year-old Briton got caught up in an early battle for position and, by the time he’d forced his way to the front of the group and had clear track in front of him, had lost contact with the leading group of six riders. The Pata Yamaha rider’s pace over the second half of the race was fast and consistent, but the gap ahead of him proved insurmountable and he crossed the line in seventh position, well clear of the pursuing pack. 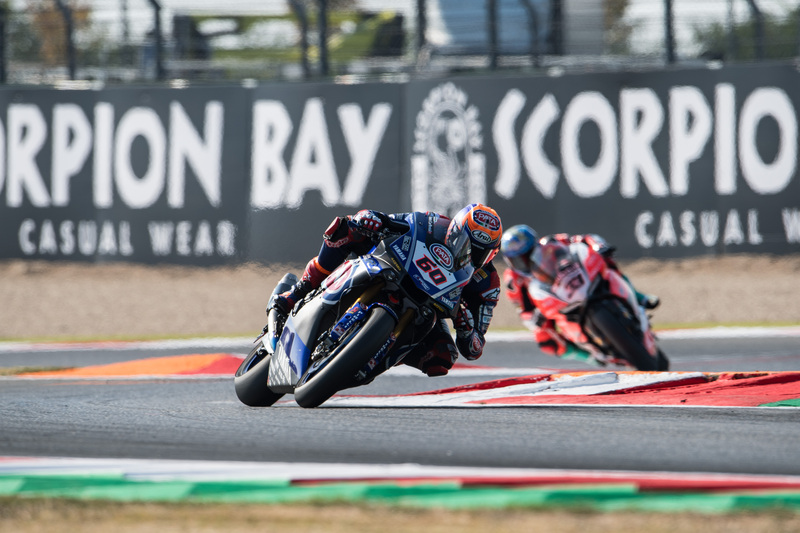 Lowes was disappointed with his race results after a strong qualifying performance, but heads to the next race in Argentina determined to rediscover the form that saw him take his first WorldSBK race win in Brno earlier in the season.